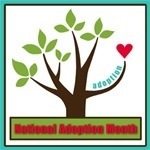 And in the spirit of promoting adoption (and the spirit of not continuing to neglect my blog), I am going to try my best to blog something adoption related every day. I will be focusing on Foster Care adoption, being that is where my heart lies. But I encourage everyone, to pursue any type of adoption that speaks to them. A child in need of love, is a child in need of love. It doesn’t matter where they come from, or how they came to you. The important thing is they find a family to give them a soft place to fall. You don’t have to be perfect to be a perfect parent. There are thousands of kids in foster care who would be happy to put up with you. One of the misconceptions a lot of people have about adoption is that in order to be eligible to adopt, you have to have a big, beautiful home, in pristine condition, great paying jobs, and money to burn. That’s actually not the case at all. People from all walks of life can be adoptive parents. Honestly, what they’re looking for are people who are real, and can love a child or children unconditionally.